If you have any suggestions for a class you would like to see please feel free to let me know. To see class schedules and registration form, click here. Refund Policy: There are no refunds once your class has started. If you’re not sure that positive training is right for you, please come and watch a class first. Advanced Puppy K – 6 classes – all classes are with the dogs. This is for the group that wants to continue with training and stay together with the same group of people and dogs. We review what you have already learned and continue to add new behaviors. These new behaviors vary depending on the group itself. My goal for this class is to have the dogs off leash (inside of course) as much as possible. Performance Puppy – 6 week course, first class without the dogs. Start your puppy off right! This class will be geared for all types of competition for those of you that already know you want to compete in dog sports. Agility, competition obedience, rally will all be addressed. Normal Puppy K stuff will also be addressed. 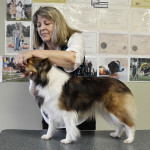 Beginners – 6 classes – first class without the dogs, remaining five classes are with the dogs. Eye contact, sit, down, stand, stay in all positions, come, loose leash walking, sitting politely for petting, door etiquette, impulse control, and a few pet tricks. Advanced Beginners – 6 week course, all classes are with the dogs. The first five behaviors needed for the Canine Good Citizen test. You will also be learning other behaviors, such as come with distractions, stay with distractions and more useful pet tricks. Continuing to build those foundation and free shaping behaviors and working off leash indoors and on leash outdoors (when the weather is good). Foundation to Agility – 6 week course, This is where the introduction to agility begins. Flat work, plank work, target work and introducing crosses. Introduction to jumping and the “T’s” (table, tire and tunnel). Teams can expect to stay in this class for more than one session. Timid Dog Agility – 6 week course, all classes are with the dogs. Limit of 4 dogs in the class. this class is for those dogs that are afraid of just about everything. We’ll be using shaping (and a little luring if needed) to help them overcome some of their fears. This class is not really about agility – you’re most likely not going to end up on the World Team – it’s about using agility/shaping to build confidence in you and your dog. Tracking 101 – 6 week course. 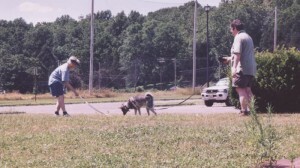 This class will get you and your dog started for the sport of AKC tracking. In this venue, you will “lay” (walk) a track and your dog will learn to follow the scent of the person that walked the track. Tracking 101 will include straight lines, curves and angled turns. No prior skills needed – just a nose! Breed Handling with a Twist – 6 week course, all classes are with the dogs. in this class we will actually be *teaching* the dogs all of the behaviors needed for the breed ring, as opposed to just dragging them around. Teaching them to gait, free stack, hard stack, accepting handling and more will all be part of this class. Cost: $100 for five weeks. Building an Off Leash Dog, Part One – 6 week course, first class without the dog, remaining 5 are with the dogs. This is the first in a series of 4. To build an off leash dog, we’ll need to make you more interesting than the environment and build special foundation skills, as well as the normal puppy skills. Whistle Recall – 6 week course, all classes are with the dogs. This class is based on my DVD of the same name. Maximum of 5 dogs per class. All of the dogs MUST be good with other dogs and people, since eventually we’ll be off leash or leash dragging. Cost for this class is $160.00 which includes 1 whistle. Extreme Pet Tricks – 6 week course, all classes are with the dogs. Have you ever wondered how trainers get their dogs to “say your prayers,” grind their own toenails, clean up their toys, do a handstand and more? Then this class is for you! For the novice or not so novice trainer/dog, all levels are welcome. (includes service dogs tricks – turn lights on and off, retrieve the phone, etc. Rally/Competition-Level 1-Novice – 6 week course, all classes are with the dogs. Rally is a new and upcoming sport that takes all of the behaviors that are pretty standard when you train your dog – walk on a loose leash, sit, down, stay, etc. – and makes them fun and rewarding. And, you get to earn titles! 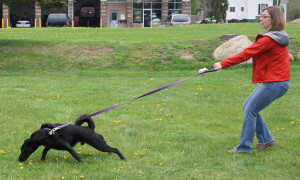 Rally is a great in-between sport, if you can’t decide what to do next – whether it be earning your CGC or TDI, going into competition obedience or starting agility. Rally is the sport for you! Advanced Rally/Competition-Level 3-Utility. 6 week course, all classes are with the dogs. Drill Team. 6 week course, all classes are with the dogs. The behaviors are similar to rally and obedience, but the exercises are done in a group in sync with each other. Pre-requisite – your dog must have a modicum of a heel and be good with other dogs. Take a look at some Drill Team class videos! Intro to Treibball – 6 week course, all classes are with the dogs. Treiball is new sport that came from Germany is also called “push ball” or “soccer for dogs.” Whatever it’s called, its FUN FUN FUN! You don’t need a herding breed or even a dog that is very athletic – the dog in this video clip is both of those, but not to worry – you can do Treibball with your calmer dogs too! Great for dogs that no longer do agility and for those handlers that don’t want to run agility. This 6 week class is all about training “tricks in tandem” – training two or more dogs together. I’ve been having so much fun training two of my dogs, I wanted to share that fun with you! Your dogs should be relatively well trained and able to work off leash. You can bring 2 or more dogs to the class. Loose Leash Walking This mini crash course will be held indoors as well as outdoors. Equipment needed (special harness – leather tracking harness with padded breastplate or X back sledding harness – and long line) – ask Pam. Acting Classes for Dogs! This series of classes will be about teaching your dog behaviors needed for print ads, commercials, TV shows and movies. Once your dog reaches a certain level of proficiency, my agent will come, take photos and put you in her database for future jobs! The behaviors listed below are just a small taste of what you and your dog will learn! In addition to the behaviors learned, distraction training will also be addressed (walking on city streets, up elevators, in crowded rooms with millions of people and cameras). Being flexible and training on the fly is also a part of these classes. Target with nose, paw, chin, target to a “mark,” sit in chair and place paws on table, work for a stranger, ride a skateboard, close doors, lie down/head up, lie down/head down, lie down/head on paws and more! Jump a jump, open doors, pull objects, put paws up on windowsill and look out, kiss someone’s face, working off leash, go fast or slow on cue and more! Lift leg (as if peeing), go through a door and stop, go around objects and stop, play with a stranger (petting, hugging and with toys), retrieve any object, go to a specified place and more! Bite pants leg on cue, put toys away, carry toy to a mark and drop it, hump a person’s leg on cue, learn the names of body parts and more! **The reason I developed these classes is because I just had the opportunity to do a TV commercial with Emma (Olympic Paint). I had so much fun (as did Emma). After being stuck in traffic with my agent for hours :o(, the idea for these classes came to me. I ran it past my agent and she thought it was a super idea, since there doesn’t seem to be any acting classes for dogs. She will feed me more behavior ideas as she thinks of them, but these are enough to start with. Whitman’s Sampler – A taste of everything! Tricks, Freestyle, agility prep, free shaping and more, all rolled into one! Prerequisite: Beginners class with me. On the Road – 4 week course held only in the spring, summer and fall – all classes with the dogs. We will take the dogs “on the road” and meet in 4 different locations to train the dogs in more real life scenarios, building on the skills already learned in the previous levels. Back to Basics – 4 week course, all classes with the dogs. This will be a 4 week course to get you back on the right track if you haven’t been in for training in awhile. A great refresher course to add between levels! Everyone in the Pool! – 4 week course, all classes with the dogs. Just like this sounds, we will be teaching the dogs to swim! Not all dogs naturally know how to swim. If your dog will go into the water but only up to a point, this is the class for you. We will take the dogs to 3 different locations with 3 different water sources – a river, a lake and a swimming pool. (yes we all have to wear bathing suits…) If your dog is afraid of the water, this is NOT the class for you. Desensitization For Breed Handling *and* Vet Visits – Does your dog not allow a mouth exam? Is your dog too squirmy/happy to handle a body exam? Is your dog nervous about being examined? This mini course will teach your dog to willingly accept all of the behaviors needed for the breed ring, as well as for vet visits. Pre-registration is a must. Leave it, aka Mine! This 3 week class will get you on the road to getting a very reliable “mine” cue. An invaluable behavior, which can save you a great deal of heartache as well as emergency trips to the vet when your dog races to get the “cookie” you dropped – only it wasn’t a cookie, it was medicine that is toxic for dogs. Or drinking out of that stagnant puddle on the trail that can contain bacteria or the puddle in the parking lot that can contain deadly anti-freeze. And let’s not forget the old standby – goose poo! 3 session/3 hours. Write to me any time with suggestions for classes!